At Bekins, we’ll help you find exactly what you need – we offer everything from fire extinguisher training to first-aid kit sales and refills. The right fire safety training and supplies can make a life-saving difference in the event of an emergency. Be prepared with our exciting, hands-on classes and our wide variety of safety products. Call us today to learn more! Every company or business is legally required to have their extinguishers maintained on a regular basis to ensure proper operation. In the event of a fire, a fire suppression system can make a huge difference in saving lives and keeping your building intact. 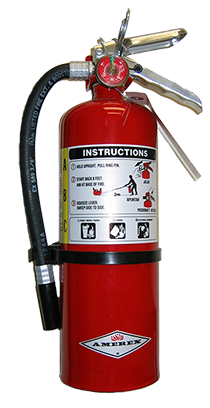 Instruction on the classes of fire, the types and applications of fire extinguishers, the fire tetrahedron, and fire extinguisher operation. Until you have actually operated a fire extinguisher, you aren't fully prepared to use one in an emergency. Need a mobile fire extinguisher inspection? Whether you need fire safety training for your employees, an automatic fire suppression for your restaurant or other business, or dependable fire extinguisher inspection and maintenance, we’re here to help you make the necessary preparations and stay safe in case of a fire emergency. Call us 24 hours a day for our convenient mobile fire extinguisher service! From first-aid kits to fire extinguishers, we have everything you need to be prepared for a fire emergency. Keep your employees safe by having supplies on hand that will help prevent or suppress a fire in your workplace. We’re Siouxland’s largest fire equipment company and are proud to offer a huge selection of fire safety products. Our company began in 1990 when we realized that Sioux City’s small businesses didn’t have many resources to prepare for fire emergencies. We’ve been serving our community for more than 30 years now, and we offer thorough fire safety training for businesses, fire extinguisher refills and maintenance, fire suppression systems, and many safety products. We'd love to help you choose the best supplies for your home or business.